Ok, I’ll admit it, I have a problem. It started way back when I was just beginning my career as a retail guru. I had a hard time letting others do what I could clearly do better. Worse, I found it even harder taking the time to show them how to do it. I mean, hey, why spent 2 hours showing someone how to prune plants and pick up hamster poo when I could do it myself in 1/2hr? Ok, it was this Lao Tzu guy. I think. It took me years to overcome this. YEARS! In the end, as the wise Buddha (or was it Christ?) 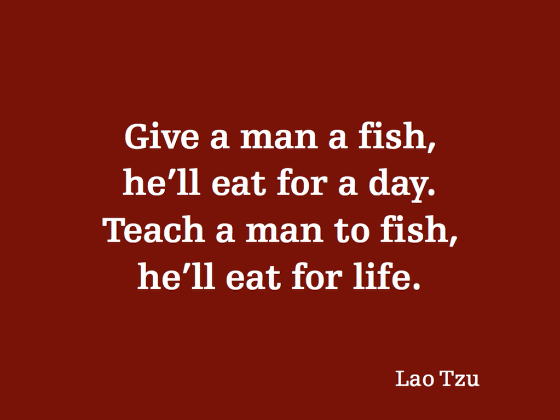 said, teach a man to fish, and you can go get fish and chips while he’s out fishing. Or something like that. So it was with the boys and what could be called the GREAT UNPACKING OF 2014. There was a ton of unpacking to do. A TON! Literally. Maybe 10 tons. Now the Prettiest-girl-in-the-world and I had a pretty good idea of what goes where, but to stand there and point while the boys unloaded boxes would be a massively inefficient use of time. So, how to give the boys some responsibility unpacking? How? We gave them control over some areas of unpacking. You have no idea. Letting go of that control, over saying, that goes there, and this goes here was hard. My left eye twitched for a whole day. By the end of the 2nd day, I had developed a palsy-like shake as I stopped myself from micromanaging their every choice. ..And this gogi berry tea goes here, and this camomile tea goes there..
First we let them unpack all the food and put it in the pantry. While we unpacked plates and strange things from boxes I’d marked, “stuff, stuff and more stuff’, they found shelves for the breakfast food, canned goods, packages of pasta, and boxes and boxes of cookies. The Youngest even sorted the tea to such a degree that he made sure each box was facing out, each had the bottom opened so that tea could be easily dispensed and even checked each box to make sure the right tea was in it. OMG! Why had we never put him in charge of doing stuff like this before? He was a genius. The oldest saw to it that we had specific areas for specific goods, that each shelf had a purpose, that each section held a greater rationale. He was like the general, designing a great strategy while the tactic genius, aka his brother, implemented the ideas. By the end, they had done a pretty darned good job. Oh sure, I would have put the labels facing out on the peanut butter and color-coordinated the cans of baked beans, but the pantry was full and organized, and they saved us adults a whole heap of time. Hmmm, thought I. What else could we have them do? So we got them to unpack glasses. Yes, glasses. Made of glass. Glass that could shatter. We told them this was serious business. Unwrap each glass carefully. Take your time. Slow is ok.
Then we stood back and held our breath. I gave it 50/50 that it would end in disaster. But no, it ended with only 1 broken glass. Just one! Even I couldn’t have done better. is 28 bottles of alcohol a lot? In truth, I don’t drink a lot. In truth, most of it IS for when people come by – I hate not being able to be a good host and so I make sure I have everyone’s favourite drink. However, in truth, there are a few in there for just us, for after the boys have gone to bed and we have survived watching them unpack the crystal. Hello, Quail’s Gate Gewurztraminer. I’m talking to you. There are some who believe the Youngest should wear this as his regular clothes. With a helmet. 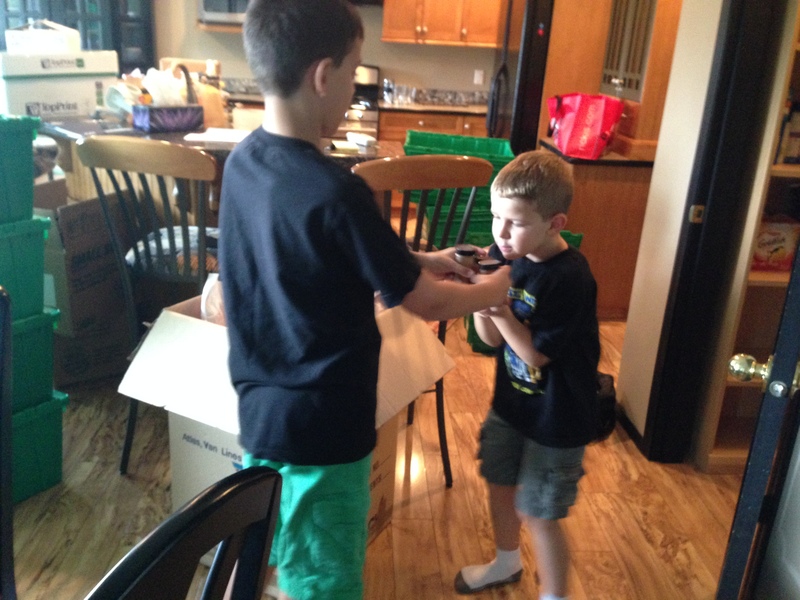 Each day, though, the boys have helped us unpack and organize our new house. They set up their own rooms. They helped move all the frog-boxes to the garage (and de-label them.) 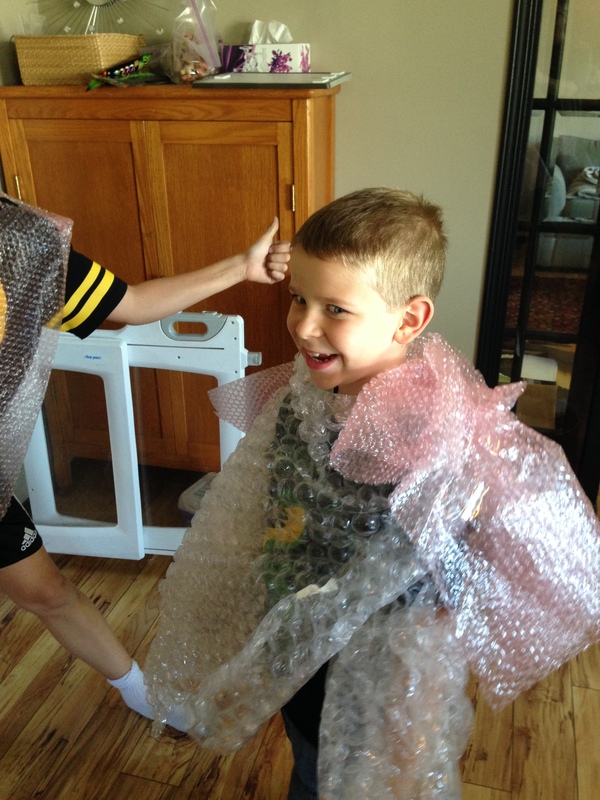 They jumped on piles of packing paper to condense it down (looking like they could both have great careers in grape-stomping at a winery.) They even swept and dusted. Wow. I never imagined they could be so helpful. So, tonight, we’ll take on the epic (and some say ‘impossible’) task of sorting out 4 moving boxes full of crayons, pencils, markers and what looks like melted gummy bears. One of those ‘bottles for friends’ may be consumed afterwards. 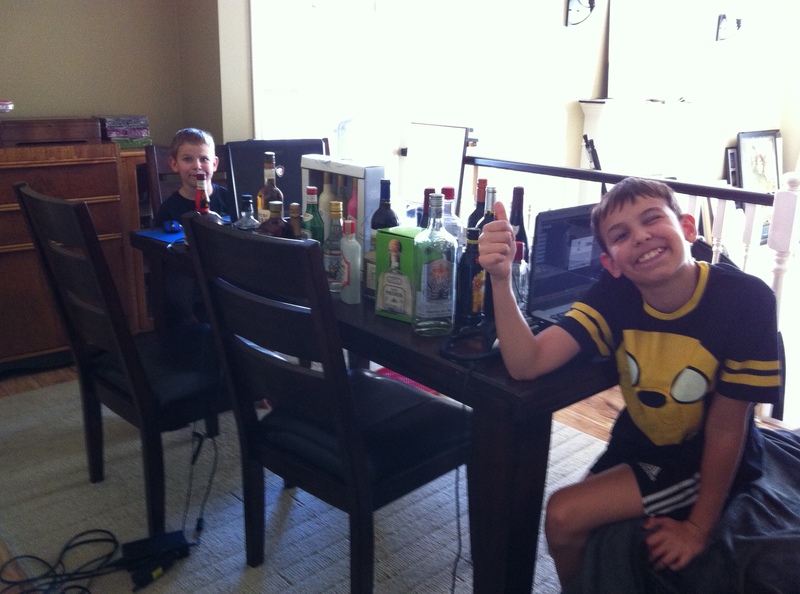 How have you had the kids help with unpacking? Any advice on things NOT to do? As always, if you like this blog, please share it, or print it out and cuddle it at night. Or like my FB page. Or reblog, retweet or repost. 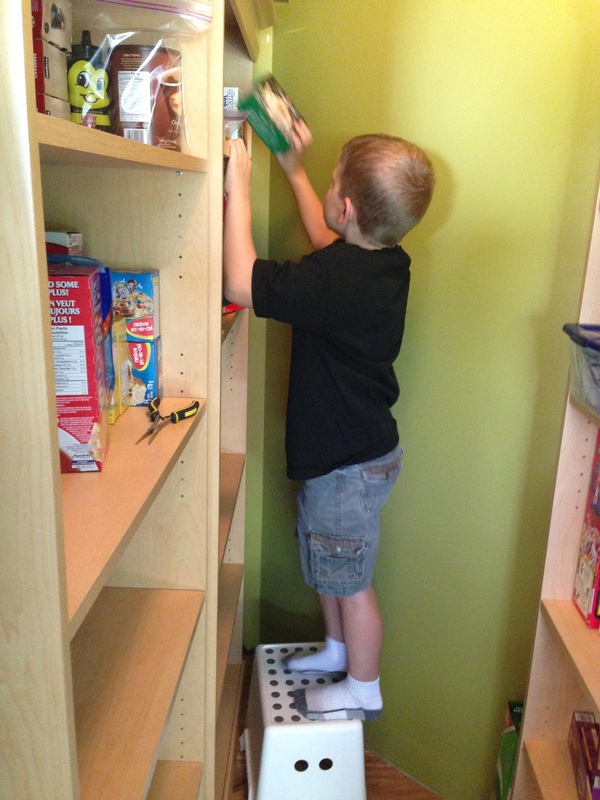 This entry was posted in Blogging, Parenting, writing and tagged baked beans, humor, humour, langley, moving, organizing, peanut butter, quails gate, sorting out a new house, the oldest, the prettiest-girl-in-the-world, the youngest, unpacking, unwrapping. Bookmark the permalink.